Intel has recently added eight unannounced desktop Coffee Lake processors to its MDDS (material declaration datasheet) database. Three new chips belong to the Core i3/i5 lineup are targeting mainstream PCs, whereas another five are Pentium Gold and Celeron products designed for entry-level systems. Their inclusion into the MDDS database likely precedes their formal introduction in the coming weeks or months. Intel has introduced six desktop Coffee Lake CPU models to date, and considering how broad the company’s processor lineups usually are, it is obvious that the chip maker is prepping more SKUs. A list containing dozens of unannounced CFL products leaked in late November gave us an idea what to expect from the Coffee Lake family in general, but without many specifications or a timeline. 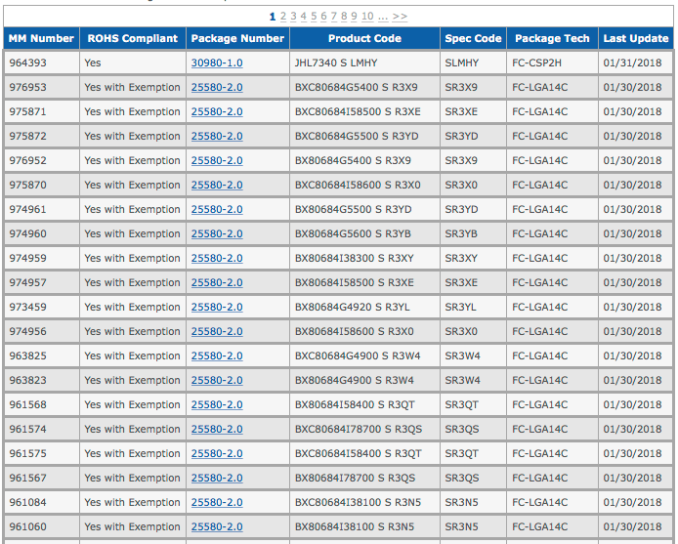 Meanwhile, last week’s updates to the MDDS* database give us an idea what to expect from Intel in the near future. The list of new Coffee Lake processors published by Intel includes its six-core Core i5-8600 and Core i5-8500 CPUs as well as a quad-core Core i3-8300 chip. The first two products will sit between the Core i5-8400 and the Core i5-8600K, so their prices will be higher than $182, but lower than $257. The Core i3-8300 will be positioned above the already available Core i3-8100 and will be priced accordingly (i.e., higher than $117). 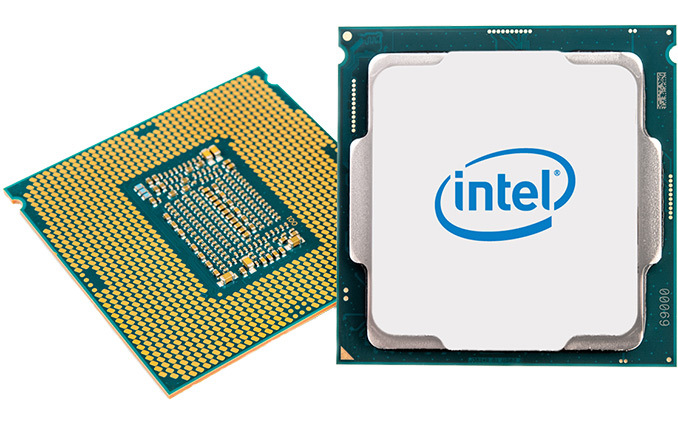 The addition of three new Coffee Lake processors to the Core i3/i5 lineup will expand Intel’s family of mainstream CFL products, but it is the addition of the new Pentium Gold and Celeron products featuring the new microarchitecture that will make Intel’s 300-series platform more attractive to consumers in budget markets. Intel has yet to announce the specifications of its Pentium Gold G5600, Pentium Gold G5500, Pentium Gold G5400, Celeron G4920 and Celeron G4900, but from what we know about the CPUs is that they all have two physical cores (the Pentium chips also support Hyper-Threading), the Intel UHD 610 integrated GPU, and approximately ~51 W TDP. As for prices, Intel’s Pentium Gold and Celeron CPUs are not expensive and usually cost around $100 and lower. Core i7-8670 6 / 12 ? ? 12 MB 65 W ? Core i7-8670T 6 / 12 ? ? 12 MB 35 W ? Core i5-8650K 6 / 6 ? ? 9 MB ? ? Core i5-8650 6 / 6 ? ? 9 MB 65 W ? Core i5-8600 ** 6 / 6 ? ? 9 MB 65 W ? Core i5-8550 6 / 6 ? ? 9 MB 65 W ? Core i5-8500 ** 6 / 6 ? ? 9 MB 65 W ? Core i5-8500B 6 / 6 ? ? 9 MB ? ? Core i5-8500T 6 / 6 ? ? 9 MB 35 W ? Core i5-8420 6 / 6 ? ? 9 MB 65 W ? Core i5-8420T 6 / 6 ? ? 9 MB 35 W ? Core i3-8320 4 / 4 ? 8 MB 65 W ? Core i3-8320T 4 / 4 ? 8 MB 35 W ? Core i3-8300 ** 4 / 4 ? ? ? ? Core i3-8300T 4 / 4 ? 8 MB 35 W ? Core i3-8120 4 / 4 ? 6 MB 65 W ? Core i3-8120T 4 / 4 ? 6 MB 35 W ? Core i3-8020 4 / 4 ? 6 MB 65 W ? Core i3-8020T 4 / 4 ? 6 MB 35 W ? Core i3-8000 4 / 4 ? 6 MB 65 W ? Core i3-8000T 4 / 4 ? 6 MB 35 W ? Pentium Gold G5620 2 / 4 ? 3 MB ? ? Pentium Gold G5620T 2 / 4 ? 3 MB 35 W ? Pentium Gold G5600 ** 2 / 4 ? 3 MB ? ? Pentium Gold G5500 ** 2 / 4 ? 3 MB ? ? Pentium Gold G5500T 2 / 4 ? 3 MB 35 W ? Pentium Gold G5420 2 / 4 ? 3 MB ? ? Pentium Gold G5420T 2 / 4 ? 3 MB 35 W ? Pentium Gold G5400 ** 2 / 4 ? 3 MB ? ? Pentium Gold G5400T 2 / 4 ? 3 MB 35 W ? Celeron G4950 2 / 2 ? 2 MB ? ? Celeron G4930 2 / 2 ? 2 MB ? ? Celeron G4930T 2 / 2 ? 2 MB 35 W ? Celeron G4920 ** 2 / 2 ? 2 MB ? ? Celeron G4900 ** 2 / 2 ? 2 MB ? ? Celeron G4900T 2 / 2 ? 2 MB 35 W ? Intel did not comment on the news story because the products have not been announced officially. *Intel’s MDDS database contains information about ROHS compliancy and usage of hazardous materials by Intel’s products. Virtually all commercial products by the company end up there. However, a listing does not mean an imminent launch. Moreover, back in the day, this database included products that were never released. Source: Intel MDDS via ComputerBase.